Artists expected to perform include: Joe Zauner, Mark Newton, Valerie Smith, Jesse McReynolds, Roland White Band, Jimmy Bowen & Santa Fe, Claire Lynch and Matt Wingate, Alan Sibley & the Magnolia Ramblers and Eddie & Martha Adcock with Tom Gray and Gene Johnson plus special surprise guests. Sound will be provided by by Clark Williams. Suggested donation at the door is $15, larger amounts will be gratefully accepted. And we encourage you to bring items that individuals and families can use: Soap, shampoo, toothbrushes and paste, deodorant, razors, shave cream, combs, personal-size tissues, new socks & underwear, washcloths, sewing kits, pens, pencils and small notebooks. All proceeds and gifts will be distributed through Room In The Inn, a local shelter system. So, load up the car and come on down. There's plenty do in the Nashville area by day. 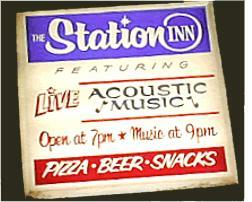 At night, The Station Inn will look for you stop by and be ready for an incredible lineup throughout the evening. Bluegrass and Roots Music. You’ll find the best of it at the Station Inn and you won't want to miss a note. Check out their calendars and see for yourself. The Station Inn... Bluegrass and Roots Music's premiere listening room, where you'll find great music, good times and friends you've yet to meet.